Once you begin the Teslin River guided canoeing adventure, you are transported into a world of calming serenity, picturesque scenery, and connection with people that are and were the great story that is the Teslin River. The Teslin may not have the name recognition that the Yukon River has, but it is in its own right as culturally and historically relevant to the story of the Yukon. 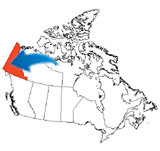 Note: The Teslin River, aside of its standing as one of the Yukon’s great rivers, avoids Lake Laberge, with its strong funneled winds that can make canoeing potentially very dangerous, and can delay safe travel for days. a glaciated landscape of low hills, granite rock, high sandy cliffs, and spruce forest. remote and serene, with a deep connection to nature and history. wildlife possibilities include eagles, moose, peregrine falcons, to the occasional bear. reminders of the movement of people and sternwheelers on the river are evident to this day. 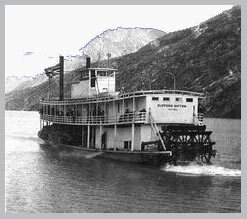 visit to Hootalinqua, a significant trading and sternwheeler depot during the gold rush. View a Photo Essay of our Teslin River Guided Canoe adventure.